Fish head noodle is a very common noodle soup back home, I can still vividly remember the image of my ex-colleague Katherine having this as lunch almost every day for 3 months! Well..... 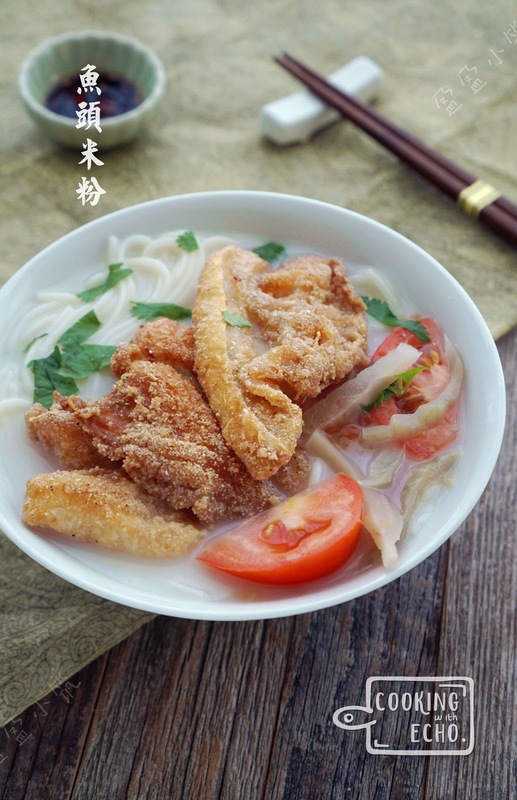 It is definitely a very tasty dish, a good blend of milky soup base, sourish vegetables and crunchy fried fish head! Bring all the above ingredients with 10 cups of water to boil and simmer for 4-5 to form soup base. You can shallow fry the anchovies to before boiling, that gives better flavor to the soup. OR 4 cups of Chicken Stock. 1. Place Anchovies/plaice powder in a pot with 4-5 cups of water, bring to boil to make stock, or use ready made chicken stock. 2. Cut fish head/bone into 3 inch pieces, sprinkle some salt and pepper powder, marinate for 10 minutes. After 10 minutes, sprinkle cake flour and mix well. Heat up 2 inches of oil in a cooking utensil and deep fry the fish pieces. It may take 2-3 batches to finish frying the fish. 3. Slice pickled mustard, cubed tomato, shred ginger. 4. Soak rice vermicelli in cold water, when it becomes soft, blanch it in boiling water for about 1-2 minutes before use. 5. For dipping/sauce, mince about 3 Thai chilies, mix with 1 tbsp of soy sauce and 1 tbsp of dark vinegar. 6. 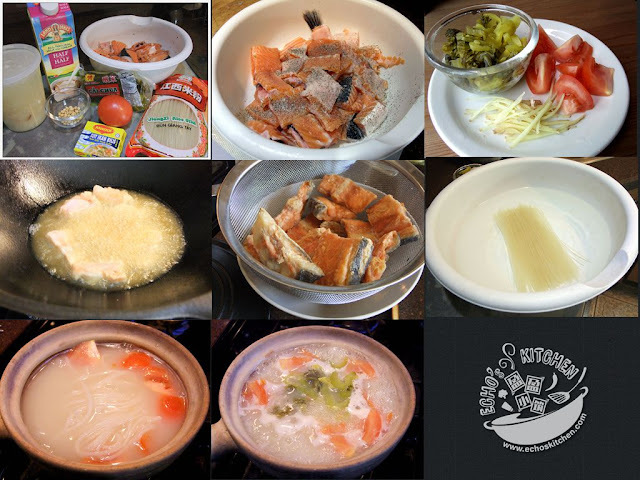 Pour in about 2-3 cups of stock in a small pot, bring to boil, add tomato pieces and pickled mustard and cook for about 45 seconds, now add vermicelli, bring to boil again, season with salt and fish sauce. 7. Add 2 tbsp of milk/half & half/evaporated milk before removing from stove. 8. 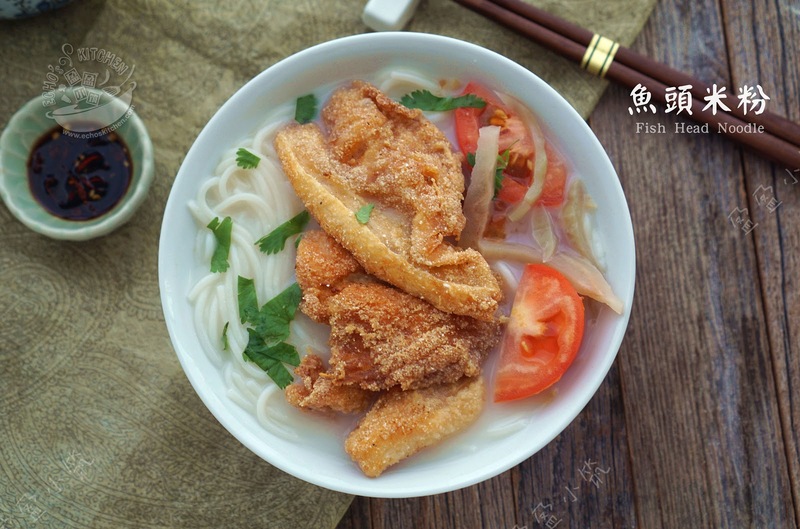 Place the fried fish pieces on top of the noodle soup, garnish with spring onion and shredded ginger. Sprinkle a little pepper powder and few drops of sesame oil before serving. They said memories of taste stays the longest of time... its true... for me, and my loved ones!
" me n my apron "